Call us today to tour our practice and meet the team in person! 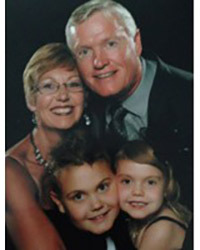 Melanie and her husband, Marty, (along with their 2 fur babies at the time) moved to Sherwood Park from the West Island in Montreal in December of 2004. After travelling the world for a year, Melanie had become a regular yoga practitioner and was trained as a natural health consultant specializing in energy work. After moving to Alberta, she decided to take her Yoga Teacher Training Certification at Yoga for Today and began teaching upwards of 10 classes per week. In August 2005, Melanie became a patient of Dr. Dave’s. By January 2006, she was employed at Brisbin Family Chiropractic, she balanced teaching yoga with her job as a Chiropractic Assistant. In 2011, Melanie and Marty had their first baby, at home: Emma and in 2014, and they had their second baby, also at home, in water: Madeleine! Both girls were adjusted within hours of being born and they continue to enjoy the benefits of Chiropractic Care! As a family, they enjoy spending time outdoors, taking their dog, Maya, for walks and spending time with friends. Melanie is very grateful for our awesome team at Brisbin Family Chiropractic. She knows you can feel the love as soon as you walk through our doors. Nicky graduated from Grant MacEwan in 2013 with her diploma in Holistic Health. In her training Nicky became skilled in both acupressure and reiki and loves the satisfaction of making people feel and live better. Her knowledge acquired in her years of schooling have helped to compliment the further learning that has come with working at Brisbin Family Chiropractic. The understanding of wellness and complete body healing is not lost in this office and she loves the integration of a holistic mindset that all the staff and doctors take to chiropractic care. When Nicky is not busy working, she loves being a full time mom of her one year old son Kallum. She also enjoys playing soccer and keeps active by hula hooping, running and practicing yoga. Her and her husband spend their free time visiting with family, cooking delicious meals, and relaxing out at the lake. Kallie has been getting adjusted since she was 14; although her previous care was more relief based she has quickly learned that the wellness approach that all the doctors at BFC recommend really makes a world of difference! Kallie was recently married in October last year and even sends her husband for regular adjustments when he is in town. As a guy who works in Fort McMurray, no one knows the benefits of a healthy spine more than Cody! 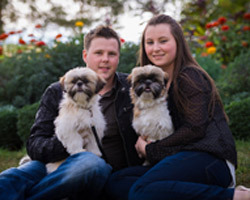 Kallie, Cody, and their two Shih Tzu puppies, Maddox and Ruxxin, all love to go camping and enjoy long walks through the walking trails of Glen Allen. Kallie also plays softball on a mixed league in Sherwood Park and is eagerly waiting for the season to start! Lori was recommended to Brisbin Family Chiropractic for neck and upper back issues, and she continued treatment for 3 years to maintain good health. Each and every visit, she enjoyed the positive, caring environment. She knew, when the time was right, that she wanted to be a part of the “BFCTeam”! 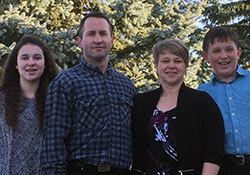 The greatest joy and blessing in Lori’s life is her family. She treasures every second with their 2 grandchildren, especially Friday night sleepovers and weekends at the cabin. Leeann joined the team at Brisbin Family Chiropractic in October 2017 and has been impressed with the wellness-based approach the clinic takes. Leeann has a Bachelor of Science in Food and Nutritional Sciences from the University of Alberta, and recently acquired a Medical Office Assistant Certificate from St. Lawrence College. She is an avid volunteer at her kids’ school, with the Strathcona Food Bank Association and at the Edmonton Humane Society. She enjoys spending time with family, camping, reading, and skiing. Addison has been a patient of Brisbin Family Chiropractic since 2015, and has always loved the welcoming and caring environment of the office. When her best friend/manager Nicky was looking for someone to join the Chiropractor Assistants during the summer of 2018, Addison was happy to be given the opportunity to jump to the other side of the desk! Addi has worked in bars and restaurants for ten years, and chiropractic care has helped her relieve the stress her body goes through after long days on her feet. She is an avid traveller, and she loves the feeling of getting an adjustment after a roadtrip to the mountains or long plane ride. 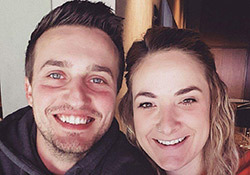 She is currently a student at Macewan University to become a Physiotherapy Assistant, and Addi loves being able to see many of the concepts from class being applied to help patients feel better. Her favourite part of the job has been hearing all of the success stories from patients who see improvements in their health from consistent chiropractic care. Addi grew up in Sherwood Park, and although she currently lives in Edmonton with her boyfriend Kevin and puppy Boomer, many of her friends and family still live in the Park, so she loves that her job has brought her back to the family orientated community. When she isn’t studying, Addison likes to travel, practice yoga, catch up on Netflix shows, and give lots of love to her puppy! 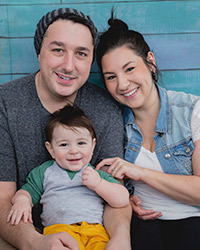 While teaching elementary school in Edmonton, Stacey first became interested in chiropractic in 2009 when she met Dr. Brisbin at a trade fair. She began coming to Brisbin Family Chiropractic soon afterwards to help with stress and insomnia. After only a few treatments, she was sleeping through the night and feeling much more relaxed. Not only that, but she found it easier to stand while teaching and had more energy for her students! The results were so profound that Stacey made a presentation on the benefits of Chiropractic and shared it with her staff and her students! She knew chiropractic would be a part of her life forever! After learning about how natural health care, like chiropractic, could help to heal a person physically, mentally, and emotionally, Stacey went back to university to get her Holistic Health Diploma. She is now certified to practice Reiki, Reflexology and Acupressure and uses these modalities to help other people achieve balance. Stacey is constantly recommending Chiropractic to her clients as a part of their care. Now Stacey gets adjusted regularly to keep her immunity up, help with hip pain, and to maintain wellness. Stacey loves helping people to better understand wellness and to reach their inner potential. She loves kittens, cupcakes, and making people smile. One day Stacey dreams of utilizing her skills to help children manage their mental, spiritual, and emotional well being. Stacey and her husband Aaron incorporated a spiritual labyrinth walk into their wedding ceremony September 2014. They are excited to welcome their first child in March of 2016! Stacey and Aaron are planning to have a home water birth utilizing relaxation strategies and natural pain relief techniques. Throughout her pregnancy, Stacey got adjusted every week to help manage the changes pregnancy can often bring such as difficulty with sleep, nausea, heartburn, hip and low back discomfort and decreased energy levels. As a result, she experienced very little of these symptoms and had a comfortable, healthy pregnancy. Stacey would recommend regular chiropractic care to anyone who is expecting! I am beyond thrilled to have been welcomed aboard as part of the team at Brisbin Family Chiropractic! I have a long medical history of trouble with my knees and L5 S1 Lumbosacral joint and truly believe that Chiropractic care is the very reason I am able to walk without help and move without pain. 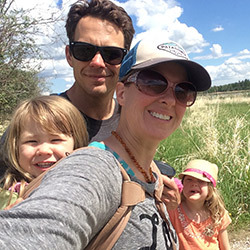 Jamie has a background in health care both as a Licensed Practical Nurse in long term care, and later as a Clinic Assistant in a number of Calgary area clinics. She truly enjoys assisting others and looks forward to getting to know all of the wonderful patients at BFC. In addition to her role at Brisbin Family Chiropractic, she is looking forward to taking Wisdom Coaching Courses. The courses will teach her how to coach children through storytelling and activities and guide them to develop strong mindset skills that will assist with things like self esteem, confidence, integrity, excessive worrying and much more. Jamie is a lover of people, plants and animals. 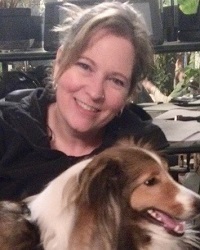 She likes to spend her free time reading and watching documentaries, walking the family dog “Colby”, going to Farmer’s Markets and Artisan fairs, and seeing stand-up comedy or live music. Her favorite song is Solsbury Hill by Peter Gabriel, her favorite movie is Sophie’s Choice with Meryl Streep, and her favorite book remains to be found…….. I don’t like coffee, watermelon, or Lord of the Rings Movies…..sorry, not sorry? I can make a chicken out of a tea towel. I have never had surgery. And…..the idea that there are more stars in the universe than grains of sand on earth really, really hurts my brain.